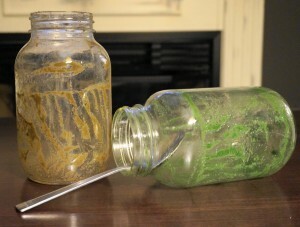 I started the day with these two Mason jar delights. The brown-coloured concoction gets its dreary looks from a combination of greens and berries, in addition to the regular players (lemon juice, cinnamon, flax/chia, etc.). The brighter version comes from an abundance of everything green, from celery and green apple to collards and dandelion leaves and spinach…and spirulina. In moments, the damage was done. I’ll admit it: I reach my fingers down the sides of the jar as far as they’ll go to capture as much of this liquid gold as I can. Mmmm. 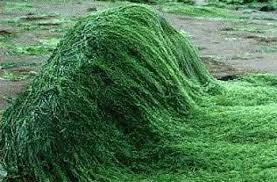 I’ve mentioned this freshwater plant from time to time in earlier blog posts. But I wanted to single it out as a SUPER food you may want to consider adding to your diet. The obvious in-your-face characteristics: it’s forest green and has an ever-so-slight fishy odour. The not-so-obvious: it’s so, so, so good for you! 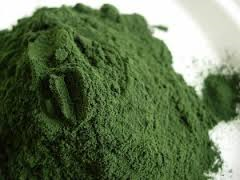 This blue-green, nutrient-dense microalgae is harvested from warm, fresh water lakes and is turned into a thick paste, then dried into a powder. First of all, research your brand to ensure it is pure and free of contaminants. Head off to your favourite health food store and buy it in powdered form. Then, start slowly, especially if your body is in need of a detox (slowly means 1/2 to 1 tsp a day) and also to get used to the taste. If you’re a healthy sort of adventurist, take the plunge with a full tablespoon (you don’t need more than that). Add it to your smoothie or your salad dressing. 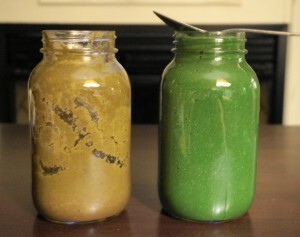 Make a green soup (spinach, kale, celery, garlic, stock, spices) and add spirulina after you’ve cooked the soup. Frankly, spirulina won’t appeal to all palates. For some reason, I latched on to it immediately and I quite enjoy the flavour.